I woke up Saturday morning, watched a few cooking shows while I sipped on my hot cup of coffee and lounged around for a few hours. By the time noon came around, I was hungry and I wanted a quick and easy lunch. 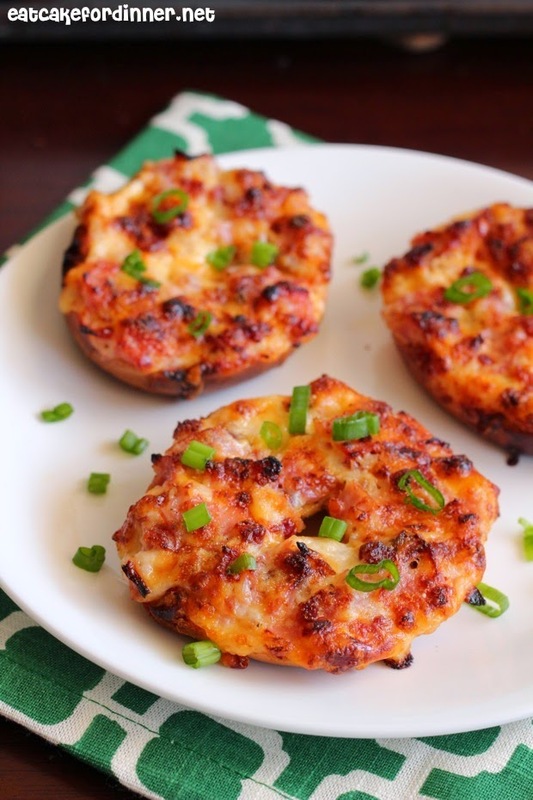 I grew up eating Bagel Bites and I loved them. 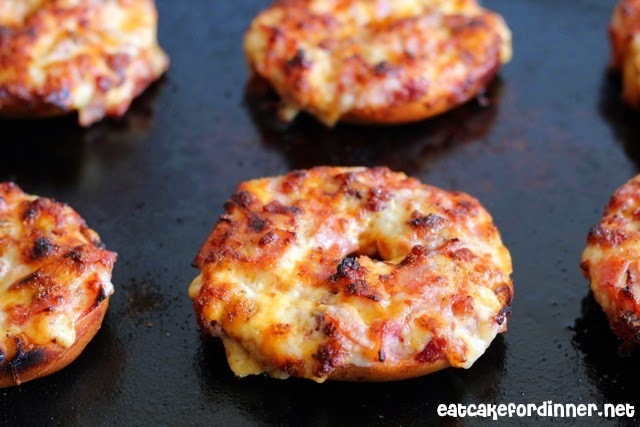 This is my grown up version of those delicious mini bagel snacks. Instead of using mini bagels, I used small bagels. They are between the size of mini and regular. I used Mayonnaise as the binder, just like in this Olive Cheese Bread and these Muffin Melts. I have now made these several times and I love them. 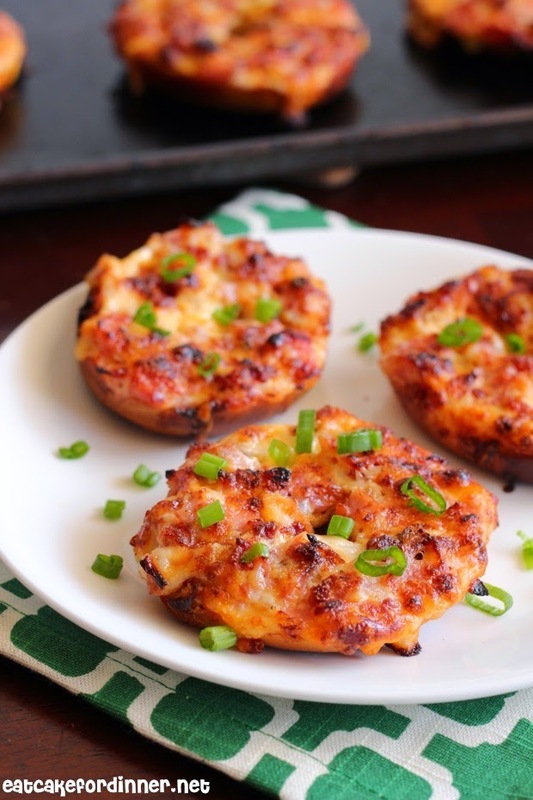 They are perfect for breakfast, lunch, an after-school snack or even dinner. They take minutes to throw together and then they are baked until the cheese is melty and bubbly and absolute perfection. 1/8 tsp. onion powder, opt. 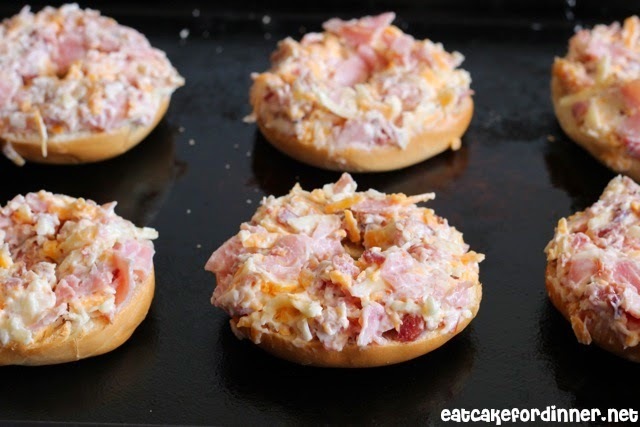 In a medium bowl combine the ham, bacon, cheese, mayonnaise, Johnny's garlic seasoning and onion powder. Spread mixture over bagel halves and place on a lightly greased baking sheet. If you want a crispier bagel: bake at 350 degrees for 6-8 minutes and then broil for 2-3 minutes. If you want a less crunchy bagel: broil for 4-5 minutes or until lightly browned and bubbly. Garnish with green onions, if desired, and serve. Jenn's Notes: I buy a big bag of Bacon Crumbles from Costco and that is what I like to use, because it is so much easier than cooking bacon.